The antidote to fuzzy thinking, with furry animals! Have you read (or stumbled into) one too many irrational online debates? 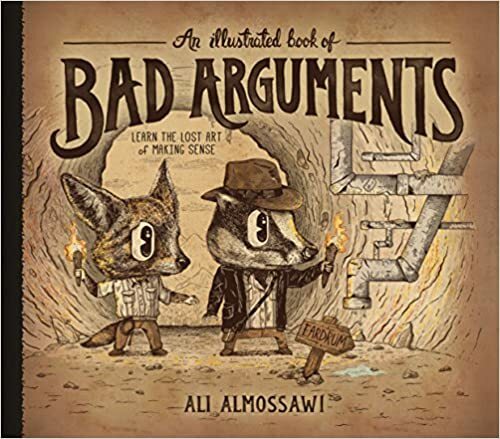 Ali Almossawi certainly had, so he wrote An Illustrated Book of Bad Arguments! This handy guide is here to bring the internet age a much-needed dose of old-school logic (really old-school, a la Aristotle). Here are cogent explanations of the straw man fallacy, the slippery slope argument, the ad hominem attack, and other common attempts at reasoning that actually fall short—plus a beautifully drawn menagerie of animals who (adorably) commit every logical faux pas. Rabbit thinks a strange light in the sky must be a UFO because no one can prove otherwise (the appeal to ignorance). And Lion doesn’t believe that gas emissions harm the planet because, if that were true, he wouldn’t like the result (the argument from consequences).